Om Parvat (also Adi Kailash, Little Kailash, Jonglingkong Peak,Baba Kailash, chhota Kailash) is a mountain in the Himalayanmountain range, lying in the Darchula district of western Nepal and inPithoragarh District, Uttarakhand, India. It is considered sacred by Hindusand its snow deposition pattern resembles the sacred ‘OM’ (ॐ). Its appearance is distinctly similar to Mount Kailash in Tibet. Near Om Parvat lie Parvati Lake and Jonglingkong Lake. Jonglingkong Lake is sacred, as Mansarovar, to the Hindus. Opposite to this peak is a mountain called Parwati Muhar. The Om Parvat is the fruit of discord between India and Nepal who do not reach agreement about the border line between the two countries. 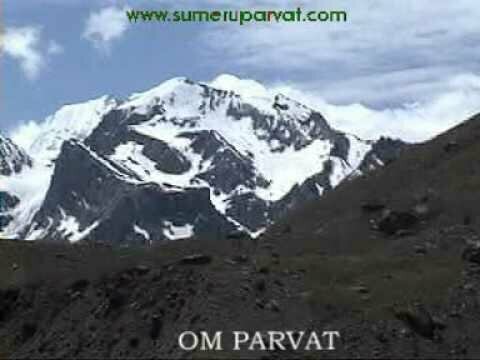 The Om Parvat is currently on the Indo-Nepalese border face “Om/ॐ” in India and the back of the mountain inNepal. This peak was attempted for the first time by an Indo-British team including Martin Moran, T. Rankin, M. Singh, S. Ward, A. Williams and R. Ausden. The climbers promised not to ascend the final 10 metres (30 ft) out of respect for the peak’s holy status. However, they were stopped around 200 m (660 ft) short of the summit by very loose snow and rock conditions. The first ascent of Adi Kailash came on October 8, 2004. The team comprised Tim Woodward, Jack Pearse, Andy Perkins (UK); Jason Hubert, Martin Welch, Diarmid Hearns, Amanda George (Scotland); and Paul Zuchowski (USA). They did not ascend the final few metres, again out of respect for the sacred nature of the summit. Om Parvat can be viewed en route to the Kailash Manasarovar Yatra from the last camp below Lipu Lekh pass at Nabhidhang. Many trekkers to Adi Kailash often make a diversion to view Om Parvat. Om Parvat and Adi Kailash or Baba Kailash are not one and the same. Om Parvat is located near Nabhi Dhang (Nepal),The Chhota Kailash is located near Sinla pass, Near Brahma Parvat. The best view of Om Parvat which “Om” drawn by the snow is the view from the district of Pithoragarh (Uttarakhand, India), which faces the mountain and hence to the “Om”.